An aneurysmal bone cyst (ABC), usually considered as a reactive lesion of bone rather than a cyst or true neoplasm, is believed to represent an exaggerated, localized, proliferative response of vascular tissue in bone. The etiology of ABCs remains unclear, and they are occasionally seen to develop in association with other primary lesions such as fibrous dysplasia, central hemangioma, giant cell granuloma, and osteosarcoma. An ABC in the jaw usually manifests as an occasionally painful and a fairly rapidly enlarging bony swelling (usually buccal or labial). The involved area may be tender on palpation. Mandible is affected more often than maxilla (3:1)  with slight female predilection. ABCs rarely occur in jaws, with an incidence rate of 2% reported so far. Most of the cases have had a unilocular occurrence. But the rarity of the present case reported is its bilateral occurrence in the mandible. 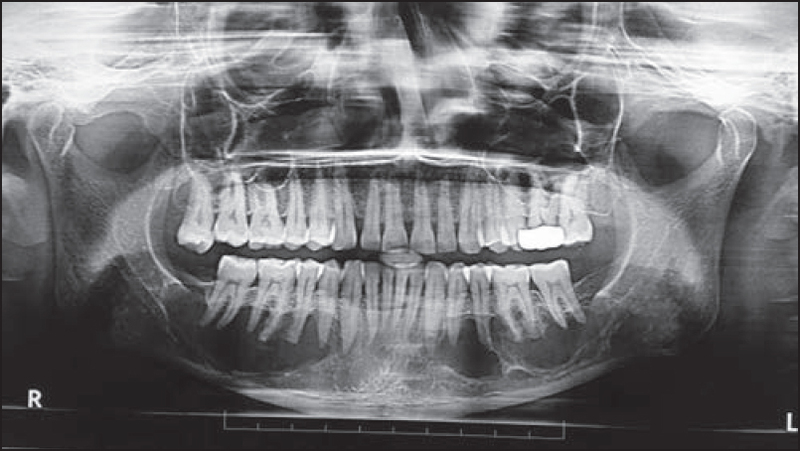 A 40-year-old female presented with facial asymmetry due to bilateral swelling in the lower jaws [Figure 1]. She reported a gradually increasing mandibular swelling bilaterally which was slightly painful since about 1 year. Buccal cortical plate expansion was noted bilaterally in the premolar-molar region, obliterating the buccal vestibule [Figure 2]. Patient did not complain of any paresthesia or numbness. On electric pulp testing, all her teeth were vital, with no mobility present. No other significant intraoral findings were noticed. Her previous 1 year panoramic radiograph (OPG) [Figure 3] and cone beam computed tomography (CBCT) reports showed multilocular expansile lesions bilaterally in the body of the mandible [Figure 4], suggestive of a benign neoplastic process involving the mandible. 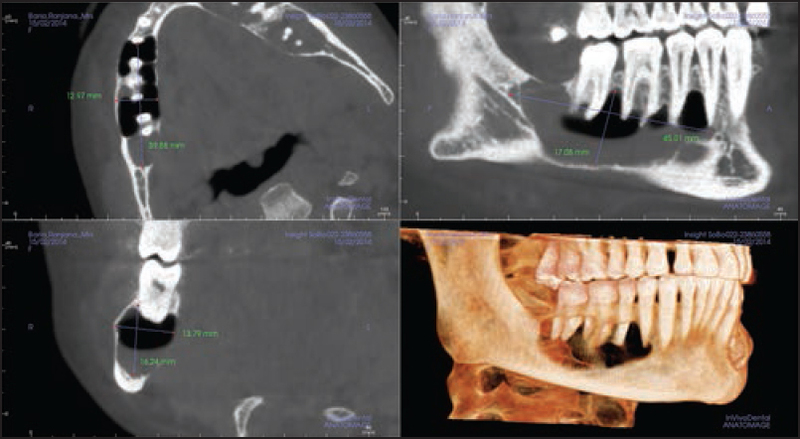 CBCT was again advised and large, destructive, predominantly radiolucent lesions were seen in the right and left body of the mandible, extending from the respective canine region to one cm distal to 47 anteroposteriorly. 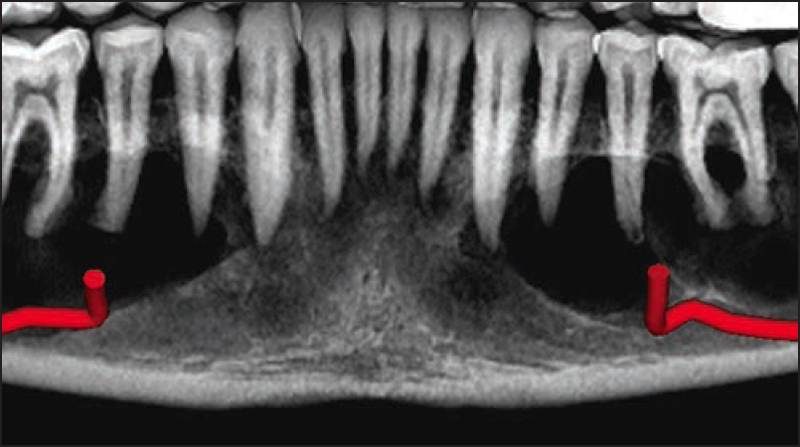 Superoinferiorly, the lesions extended from the mid-root levels of the teeth up to the inferior border of the mandible with well-defined corticated margins exhibiting a scalloped pattern, especially between the roots of the teeth [Figure 5]. The size was found to be 4.5 × 1.3 × 1.7 cm on the right side [Figure 6] and 4.6 × 1.4 × 1.6 cm on the left side [Figure 7], suggesting very slight changes in the 1 year duration. The interior of the lesions was radiolucent with few bony septae seen originating from the buccal and lingual cortices, giving it a multilocular appearance. Both the buccal and lingual cortices showed evidence of expansion and possible perforation by the lesion bilaterally [Figure 8]. The lesion appeared to have displaced both the left and right inferior alveolar canals inferiorly, near the inferior border of the mandible. The inferior border of the mandible appeared intact with no sign of any breach in its contour. Few trabeculae were noted in the mandibular anterior region, which could represent normal trabecular pattern or early involvement in the anterior region [Figure 9]. On the basis of these imaging findings, bilateral keratocystic odontogenic tumor (KCOT), bilateral ABCs, central giant cell granulomas, cystic changes in a fibro-osseous lesion, and ameloblastoma were considered as differential diagnoses. On performing fine needle aspiration at the molar region, with blood aspirate obtained from left (1 cc) and right (3 cc) sides, a provisional/working diagnosis of bilateral ABC of the mandible was considered. No atypical or malignant cells were noted in the aspirate. Under local anesthesia, the lesion was accessed and curetted completely [Figure 10]. Histopathologic examination of the postoperative specimen showed slight fibro-osseous stroma with ossicles and ABC like changes were seen with the cavity filled with hemorrhagic material [Figure 11]. No surgical complications were experienced and on follow-up, healing was uneventful. The patient is currently on follow-up [Figure 12]. Maxillomandibular ABCs are more common in the second to third decades of life. Presentation and clinical course may be extremely variable, characterized by either a slow-growing, inconspicuous lesion found on radiographic examination or a sudden, rapidly expanding lesion with resultant bony destruction and facial asymmetry mimicking malignancy or a false aneurysm. 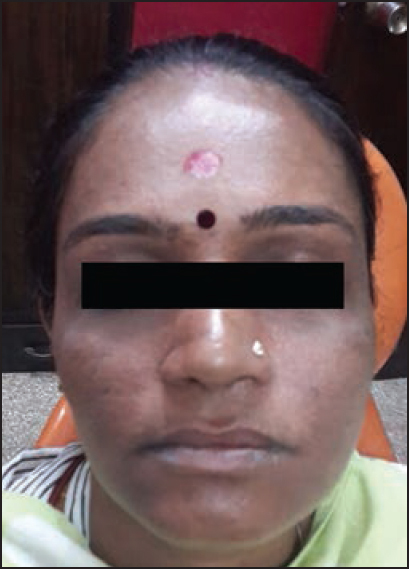 Although this patient presented with the symptoms in her fifth decade of life, the onset of the lesion is not known, and perhaps the clinical course could be slow growing. The radiographic features are not pathognomonic and are sometimes confusing. The lesion may appear as unilocular, multilocular, soap bubble, honeycomb, or moth-eaten radiolucency causing expansion, destruction of bone, perforation of the cortices, and herniation into the soft tissues, or an associated periosteal reaction with reactive new bone forming a peripheral sclerotic border, which in some cases is difficult to differentiate from a subperiosteal hematoma. The course of the ABC is often confusing, for it may range from a self-limited lesion to an aggressive, rapidly destructive lesion mimicking a malignancy. Pathologic fracture of the jaw has also been reported. 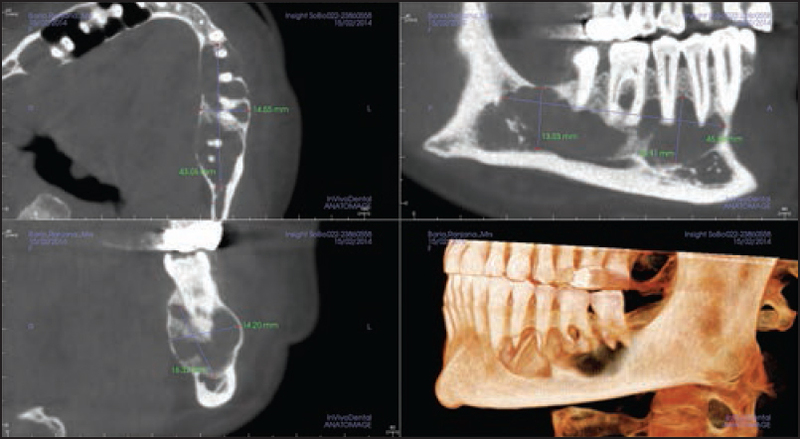 According to Kaffe et al.,  ABC has a variable radiological appearance and should be considered in the differential diagnosis of any unilocular or multilocular radiolucent lesion of the jaws as well as any mixed radiolucent-radiopaque lesion. The ABC of the jaws represents an enigmatic pseudocyst with variable clinicopathological, radiographic, and histological presentations. The bilateral expansile occurrence with the epicenter in the molar region, observed in this case, could be a slow-growing lesion with a long clinical course. Since the histological appearance was predominantly of ABC, we consider this case to be a primary case of ABC. This case was unique because of its bilateral occurrence. White SC, Pharoah MJ. Diseases of bone manifested in jaws. In: White SC, Pharoah MJ, editors. Oral Radiology: Principles and Interpretation. 6 th ed. Saint Louis, MO: Mosby; 2009. p. 445-6. Wood NK, Goaz PW. Differential Diagnosis of Oral and Maxillofacial Lesions. 5 th ed. St. Louis: Mosby; 1997. p. 343-54. Kaffe I, Naor H, Calderon S, Buchner A. Radiological and clinical features of aneurysmal bone cyst of the jaws. Dentomaxillofac Radiol 1999;28:167-72. Panoutsakopoulos G, Pandis N, Kyriazoglou I, Gustafson P, Mertens F, Mandahl N. Recurrent t(16;17)(q22;p13) in aneurysmal bone cysts. Genes Chromosomes Cancer 1999;26:265-6. Herens C, Thiry A, Dresse MF, Born J, Flagothier C, Vanstraelen G, Allington N, Bex V. Translocation (16;17)(q22;p13) is a recurrent anomaly of aneurysmal bone cysts. Cancer Genet Cytogenet 2001;127:83-4. Motamedi MH, Navi F, Eshkevari PS, Jafari SM, Shams MG, Taheri M, et al. Variable presentations of aneurysmal bone cysts of the jaws: 51 cases treated during a 30-year period. J Oral Maxillofac Surg 2008;66:2098-103. Biesecker JL, Marcove RC, Huvos AG, Miké V. Aneurysmal bone cysts. A clinicopathologic study of 66 cases. Cancer 1970;26:615-25. El Deeb M, Sedano HO, Waite DE. Aneurysmal bone cyst of the jaws. Report of a case associated with fibrous dysplasia and review of the literature. Int J Oral Surg 1980;9:301-11. Saheeb BD, Ojo M, Obuekwe ON. Aneurysmal bone cyst: A primary or secondary lesion? Niger J Clin Pract 2007;10:243-6.